Our Corps Members wake up early in the morning and travel extensively to reach all of these children. This represents 9% of children screened. All of these children receive free or subsidized follow-up care. Most student volunteers provide service as a part of a course, or as a volunteer project with a club. These include screenings at Head Starts, daycare centers, Pre-K programs, and health fairs. The development and expansion of FocusFirst would not have been possible without the generous support and guidance we received from Jim Kennemer and Vision Research Corporation. The scariest thing about children having vision problems during their preschool years is that they can't detect them—so they can't tell anyone about it. And the most important time to find vision problems is during these early years, when problems can be corrected while visual pathways are still forming. Our FocusFirst film features some of the children we have served during this crucial formative stage of their life. In the videos that follow, meet some of our youngest success stories and hear about the value of FocusFirst in the lives of young children. Catching a severe degenerative vision problem early, FocusFirst was able to save the sight of a special two-year-old named Elise. FocusFirst screened Landon at 10 months and found tumors in her eye. After treatments at Vanderbilt Eye Institute, she's ready to take on the world! Jackson's mom had no idea he had a severe vision problem until FocusFirst visited his daycare. Sami shares her experience moving to Alabama to coordinate FocusFirst and the value of AmeriCorps. We hear from Dr. Virginia Lolley who shares from her experience of the value of pediatric vision screenings. Kaylynn had a degenerative vision disorder that might have caused blindness without FocusFirst. A $500 contribution provides high-tech vision screenings for all children at one childcare center. All children who fail the screening will receive comprehensive follow-up care, ensuring they start school with the best vision medically possible. Hundreds of thousands of children across the nation suffer from poor vision each year, leading to reduced academic performance, a substandard education, and low self-esteem. We know that vision screenings are most effective during the preschool years, when early identification and treatment of many conditions can prevent irreversible vision damage or loss. Unfortunately, many preschool-age children are known to need eye care, but go without it.This is largely due to two things: poor public awareness about the importance of eye care in young children, and the inability of children to recognize their own vision problems. And for families from economically disadvantaged backgrounds, these problems are exacerbated by financial hardship and lack of access to appropriate medical care. Plus, many child care centers utilize traditional eye charts to screen their children for vision problems—even though eye charts are a notoriously unreliable method of detecting vision problems in young children, and cannot detect significant problems such as amblyopia (lazy eye) or cataracts. FocusFirst utilizes high-tech screening cameras that can not only detect a much wider range of problems in preschoolers, but are far more time efficient than traditional screening methods and have a significantly higher positive predictive value in 3- and 4-year-old children. 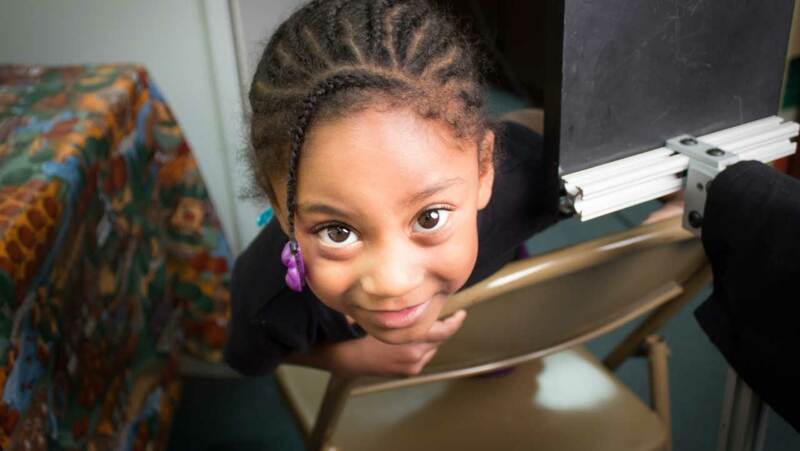 Mavanea's mom had no idea that she had a vision problem until FocusFirst came to her daycare. Watch as she recounts the story of what happened once Mavanea received her glasses and shares the importance of FocusFirst from a parent's perspective. For us, it's a milestone every time we can help give a child the gift of healthy eyes. So we're thrilled to announce that we recently screened our 350,000th child. FocusFirst Provides Vision Care to 48,500 Children in Alabama During Record 2016-17 YearImpact Alabama AmeriCorps Members and college student volunteers served over 1,300 childcare centers across the state. FocusFirst Featured in Better TennesseeBetter Tennessee, published by Blue Cross & Blue Shield of Tennessee, discusses the importance of FocusFirst in the state's preschool age children living in rural and urban communities. FocusFirst Conducts Free Vision Screenings in DothanImpact Alabama Regional Coordinator Kiwi Lanier discusses the importance of early childhood vision screenings while conducting a FocusFirst vision screening in Dothan, Alabama. Sight Savers America coordinates all follow-up care, provided free of charge, for children who fail FocusFirst vision screenings. The Southern College of Optometry coordinates follow-up care for all children who fail the vision screenings conducted by FocusFirst in the Memphis region. We are pleased to partner with the Vanderbilt Eye Institute to provide high quality follow-up care to many of the children who fail the vision screenings in the Nashville region. FocusFirst is committed to providing free, high-quality vision care to all state-sponsored Pre-K programs as part of our partnership with the Alabama School Readiness Alliance. First Steps of South Carolina has been an integral partner to connecting us to dozens of its childcare centers across the state. The University of Alabama supports FocusFirst through providing work study students who conduct screenings throughout West Alabama, offering courses that include FocusFirst as a service-learning component, and providing office space and financial support for our staff members. We are so grateful to the companies and foundations who support FocusFirst across our service area.